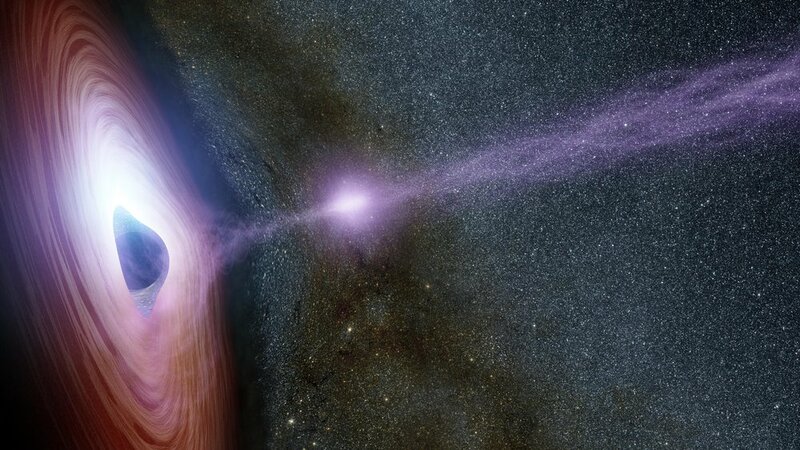 A blazar is a feeding super-massive black-hole (SMBH) in the heart of a distant galaxy that produces a high-energy jet viewed face-on from Earth. Like other forms of active galactic nuclei (AGN), blazars are the most luminous and energetic objects in the known universe. The central SMBH that drives an AGN are the nucleation seeds that stimulates the formation of their host galaxies, while the SMBH itself grows in the process. This symbiotic relationship is an analogy for BLAZAR VENTURE's role in nurturing new businesses that have the potential to transform their industries, create new ecosystems for their customers, and in so doing create a new galaxy of value for their investors, founders, employees, and customers. What's a Super-massive black hole (SMBH)? In the heart of every galaxy is an SMBH, a concentration of matter so dense that not even light can escape, in the center of which our current theories of spacetime break down. They range from hundreds of thousands to billions of solar-masses, concentrated into an object the size of our solar system. They are the nucleation seeds that attract primordial gas to form new galaxies of hundreds of billions of stars and their planets, whose combined mass, along with dark matter, forms a gravitationally bound structure that so that in all but the most violent cases, average stars can live out their multi-billion year lifetimes in relative peace. How CAN A BLACK-HOLE BE The most luminous object KNOWN? Except for Hawking radiation, which is negligible for SMBH, black-holes are indeed black. What shines is the accretion disk (AD) of gas surrounding an SMBH. As gas in the AD spirals into the black-hole, it transfers its angular momentum to the outer, infalling layers of gas, heating the gas from the intense turbulent mixing. The AD glows as it's heated to temperatures greater than the surface of the sun. Because the AD is also large (tens to hundreds of times larger than our solar system), the cumulative surface area of the glowing AD can outshine an entire galaxy of 250 billion stars, radiating off a material fraction of the total energy of all the infalling gas, and be seen far across the visible universe. What is a high-energy Jet? SMBH appear to be spinning, just like stars and galaxies, and are likely spun-up further from the acquired angular momentum of the gas they are feeding upon. Space near the event horizon of an SMBH will be "dragged" as a result of the relativistic effects of this spin, and any magnetic fields in the highly ionized AD gas that pass near the SMBH will likely be twisted and squeezed violently in the process. This is believed to create a highly collimated beam of charged particles that are accelerated to near the speed of light -- a relativistic high-energy jet. Nature's own particle accelerator, but at galactic energy and size scales compared to the one human's have built at CERN. Viewing such a jet face-on from Earth is what's called a blazar, but is only safe because of the immense distances. What's the EVIDENCE FOR ALL THIS? At 53 million light-years away, M87 is considered one of our neighboring galaxies, an otherwise nondescript elliptical galaxy. Except that it offered the first observational proof of SMBH in galaxy cores by featuring a prominent ultra-relativistic particle jet of immense energy (in blue in the photo on the left), a blow-torch some 5000 light-years in length, whose energy and narrow focus has defied any other explanation. The SMBH powering the jet weighs in at a hefty 6.6 billion solar-masses. Since then over 107,000 quasars, blazars, and other AGN objects have been cataloged. What's the symbiotic relationship between AN SMBH and ITS HOST GALAXY? One of the profound mysteries of galactic evolution is not only how SMBH first formed early in the history of the universe, but that there's a direct correlation between the mass of an SMBH and its host galaxy, despite the vast bulk of the galaxy being outside the immediate gravitational influence of the SMBH. This is known as the M-𝜎 Relation. The more mass (stars and dark-matter) in a galaxy, the faster their orbital velocity around the center, known as velocity dispersion (denoted 𝜎 in the graph at left). A feedback process is theorized that relates SMBH feeding and jet emission to star formation and its suppression that might account for this.